Last autumn 2015, Sandblast organised the photographic exhibition Africa's Last Colony: 40 Years Not Forgotten (Oct 15 - Nov 1) at London's Hundred Years Gallery, in Hackney. This exhibition was a commemoration of the 40 years of involvement of UK-based photographers in documenting and denouncing the conflict in Western Sahara, and included the work of artists such as Olivia Mann, John Tordai, Ed Harriman, Emma Brown, Steve Frank, and Quintina Valero, among many others. In order to have a memory of this fantastic event, we have now published a beautiful catalogue that gives some context about the exhibition and Western Sahara, and showcases some of the photographs. 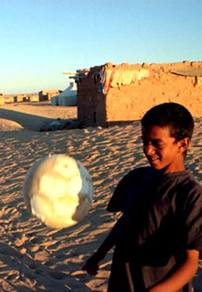 ​Tiris is a Saharawi music and dance sensation from the refugee camps in South West Algeria. Fusing the best of tradition and innovation in a raw and powerful way, they sing of love, loss, and their long struggle and aspirations for independence in their homeland of Western Sahara. Named after one of the most symbolic and sacred places in the cultural lore of Western Sahara, Tiris is a group of vocalists who perform accompanied by the traditional t’bal drum, the four stringed tidinit, electric guitar and keyboard-synthesizer and accordion. The 8-member strong group accentuates the outstanding voices of young rising star, Mufeed and Shueta, known locally as the Aretha Franklin of the Sahara, who has sung for years for the struggle. 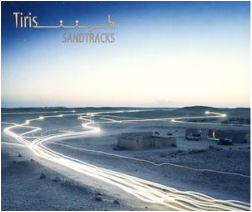 In collaboration with Sandblast, Tiris produced their first CD Sandtracks in 2007. This documentary film was filmed undercover in the Moroccan controlled territories of Western Sahara on the eve of the second anniversary of the 2010 uprisings at Gdeim Izik. It provides a moving insight into the ongoing struggle for self-determination being fought by the Sahrawi who live under Moroccan rule. 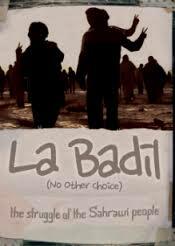 The documentary sheds light on the decades long conflict, and brings forth a resounding message from the Sahrawi about how their future should be shaped – there is no other choice (la badil) than to hold a referendum. ​Danielle Smith, filmmaker, photographer, anthropologist and Sandblast Founding Director, travelled to the Saharawi refugee camps for the first time in 1991. From the very beginning her imagination was captured by the inspiring Saharawi culture and the powerful role the arts, especially the music and poetry, but also the newly developed painting style, had played during the revolution and the 16 years of war (1975-1991). She decided to film a documentary showcasing this part of the story and Beats of Distant Hearts, the Art of the Revolution inWestern Sahara was born. Although filmed in 1996, it was not released until 2000. Twelve years later, the film is still relevant today as it shows how the Saharawi arts and culture continue to be the best way of reaching international audiences and raise awareness about the Saharawi situation. After the screening, there was a Q&A with the filmmaker. ​The desert, the density, the monotony, the human trace, living borderless… A poetic and poignant reflection about exile. Rif Spahni (Mallorca, 1972) conducted this work in the Saharawi refugee camps near Tindouf, SW Algeria, from 2005 to 2007. An epic love story: Montse and Santiago meet as teenagers in 1970s Barcelona, a poor boy and a middle-class girl ready for seduction. After they break up, Santiago flees to the western Sahara. Years later, Montse braves war and personal danger to find him. As a result of Spanish colonialism and the elevated numbers of Saharawis who have studied in Cuba since exile began, a new generation of Saharawis have emerged who opt for Spanish over Arabic to express themselves. A group of poets called The Generation of Saharawi Friendship reflect this trend. 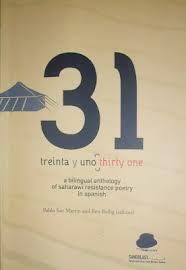 Treinta y Uno, the first anthology of their poems to be published in Spanish and English, was produced by Sandblast in collaboration with Leeds University. A selection of images from the Saharawi refugee camps and Western Sahara taken by professional Saharawi and international photographers so you can greet your friends and family in a truly special way! HOW TO BUY: please send us an email with your request, including the name of the product, the quantity and your post address, and we’ll give you the payment details. *We’re currently exploring the possibility of setting up a PayPal payment for each of our products to make this process easier, we hope to have this sorted out very soon!